Earth has just experienced its hottest decade since we began measuring such things, and 2010 is on track to be the hottest year ever recorded. That’s the official word from the world’s leading national climate agency. These observations and other long-term trends have led the Washington-based National Oceanic and Atmospheric Administration to declare that all the leading climate indicators, of which land temperature is only one, are telling us that global warming is upon us and is happening quickly. NOAA, the US government’s central weather and climate agency, has just released its State of the Climate in 2009, a 220-page report summarising what happened around the globe last year and where we’re at now. Published by the American Meteorological Society, it draws on the work of over 300 scientists from nearly 50 countries, including Australia. One of the strengths of the NOAA study is its collaboration with numerous separate institutions around the world, resulting in multiple, independent strands of evidence, all of which, says NOAA administrator Jane Lubchenco, “point to the same conclusion: our planet is warming”. Aside from the UN’s monumental IPCC report (next due in 2013), the annual State of the Climate is the pre-eminent indicator of global climate trends, prepared annually with the help of universities and research agencies around the world. Its release came in the lead-up to an Australian election in which climate policy (such as it is) has struggled to get air amid a welter of lesser but noisier topics. The ever-starker warnings from science are getting no traction in the parallel universe that is an election campaign. Unlike many other climate studies, which use computer models to project trends into the future, the NOAA report is based on observed data. As the authors say, it’s the “annual scorecard” of the climate system, an account of real climate as it happens. • Upper ocean waters continued a strong recent warming trend to record levels, demonstrating the oceans’ dominant role in storing planetary heat. • Extreme warmth was felt especially across southern Asia, South America, New Zealand and Australia (whose experience of unprecedented record high temperatures is now being repeated in Russia, with Moscow under siege from forest fires). • While India suffered a record dry and China had its worst drought in five decades, exceptionally heavy rainfall and flooding were experienced in North and South America, Britain and coastal Africa, killing many people and displacing hundreds of thousands. • Sea level fluctuated in the transition from La Niña to El Niño conditions, actually dropping during La Niña but returning to higher levels in the latter half of 2009. • Summer minimum sea ice extent in the Arctic was the third-lowest since the start of reliable records in 1979. Last year is expected to be the 19th consecutive year in which glaciers have lost volume. The oceans came in for some special scrutiny. NOAA reported new evidence that ocean waters have absorbed over 93 per cent of the extra heat trapped by greenhouses gases in the past half-century. The warming isn’t just in the oceans’ upper levels; evidence shows warming around 2000 metres below the surface. Because water expands when it warms, the extra heat is contributing significantly to sea-level rise, but the capacity of seawater to retain heat long-term is an even bigger concern. This problem won’t be going away for hundreds, even thousands of years. Those who argue that mere humans can’t influence climate have focused a lot on temperature, but the NOAA assessment is based on an array of separate climate indicators covering the planet from the poles to the equator and from the outer atmosphere to the deep ocean. The report gives special emphasis to 10 key indicators. 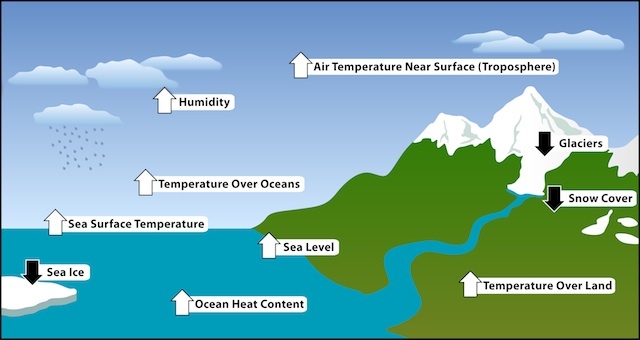 Half of these are temperature indicators (over land, over oceans, on the sea surface, deeper in the ocean and in the lower atmosphere); others are sea level, humidity, and the surface coverage of snow, glaciers and sea ice. NOAA reports that all of these key indicators, without exception, indicates a marked warming over the past 30 years, with each decade warmer than its predecessor and an “unmistakeable” upward trend in surface air temperatures. Science has been unable to find a natural cause for the warming, leaving human greenhouse gas emissions as the likely cause. The NOAA report is powerful evidence that continuing our high levels of emissions is stretching our planet’s systems to a point that threatens our human future. We’ve made much of our cleverness and adaptability as a species, but our failure to act on this is saying something much less flattering. This is really tough. While addressing the gigantic challenge of transforming our energy, food-producing and other economic systems and grasping some very complex science (demanding a lot of patience and some counter-intuitive thinking), we must deal with a campaign, supported by powerful vested interests, to undermine the science and confuse the message. The evidence is before us. We desperately need our political leaders to see it, and act in unison. This entry was posted in Antarctic, Arctic, Australian politics, carbon, carbon emissions and targets, carbon sequestration, changes to climate, climate politics, climate system, consumption, contrarians, economic activity, energy, future climate, glaciology, inquiries and reports, leadership, meteorology, modelling, natural climate influences, NOAA, oceanography, organisations and events, science, sea level, State of the Climate, temperature and tagged Africa, American Meteorological Society, Antarctic, Arctic, Asia, Australia, Australian politics, Britain, carbon, carbon emissions and targets, carbon sequestration, changes to climate, China, climate change, climate politics, climate system, consumption, contrarians, economic activity, El Nino, energy, future climate, glaciology, global warming, India, Jane Lubchenco, La Nina, leadership, meteorology, modelling, National Oceanic and Atmospheric Administration, natural climate influences, New Zealand, NOAA, North America, oceanography, science, sea level, South America, State of the Climate report, Tasmania, temperature. Bookmark the permalink.